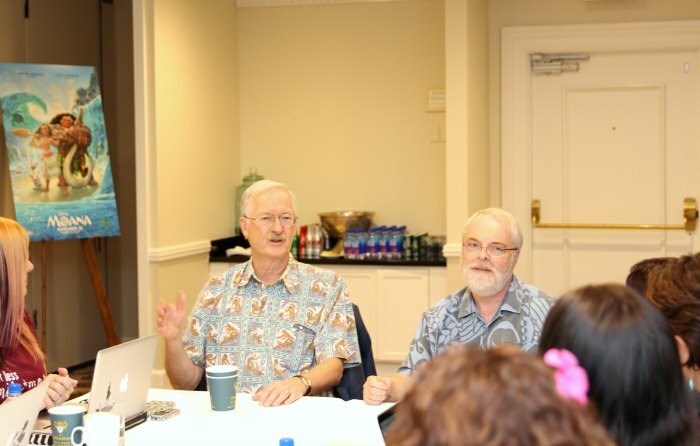 If you’re a big Disney fan, then you probably are familiar with John Musker and Ron Clements! If not by name, then you certainly are familiar with their work like Treasure Planet, The Princess and the Frog, Aladdin, and The Little Mermaid! Hello! These two are like a Disney dream team! 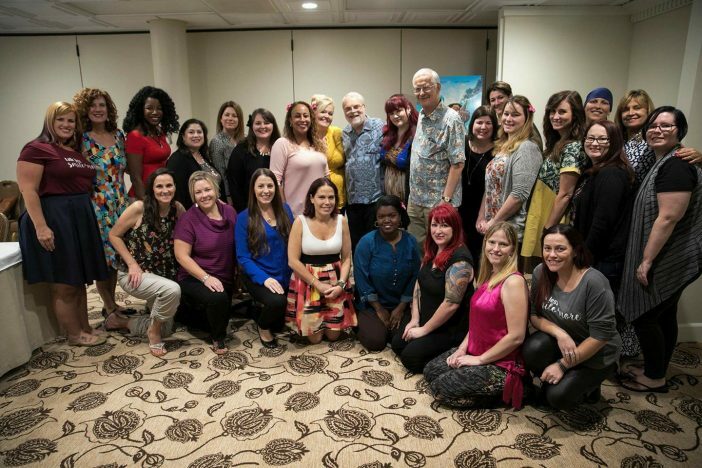 I actually had the pleasure of interviewing them before for the anniversary release of The Little Mermaid. They’re great to talk to – such creative, fun guys! 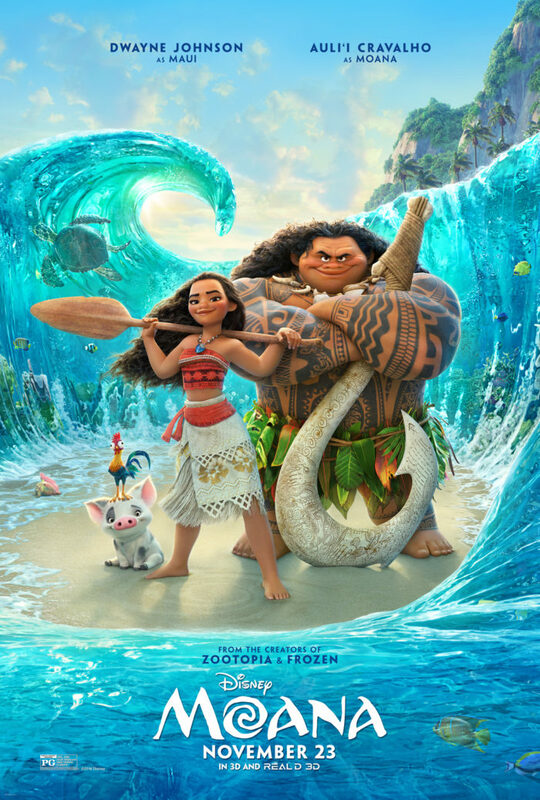 So, it comes as NO surprise to me that MOANA is #1 at the box office for the third straight weekend! AND… it’s just been nominated for TWO Golden Globes! This was the first primarily CG-animated film (versus classic hand drawn animation) for the pair, so we first talked with them about the differences & challenges that presented for them. RON : Some things are the same in terms of the script and the storyboarding and the voice actors, but the actual production process is quite a bit different. We had to actually have tutorials before even the movie started. RON: There’s a lot of, a lot of cool things you can do. But a lot of things even that had to be figured out in the movie. Even the idea of a living ocean that has a personality of a monster, a lava monster, some of those things particularly where character animation and effects animation merge, that isn’t done usually. I’ve heard animators talk before about the difficulty of animating water. So they REALLY had their work cut out for them here (especially with making it a character). But, I think it turned out well. The water sequence with little toddler Moana at the beginning of the movie is one of my most favorites ever! JOHN: We got to sail in Fiji and navigators and we really try to connect with the culture and learn how proud they were of their background as the greatest navigators the world has ever seen. RON : And their connection to– the importance of respect for nature, respect for the environment and, and also the interconnectedness and extended families and, and the idea of your heritage and your legacy. We heard this expression in Tahiti, ‘know your mountain’. And your mountain is essentially everything that led up to you, all the people that led up to you, everything that happened, all of the things that if they didn’t exist, you wouldn’t exist. And, and they said if you don’t know your mountain you really don’t know who you are. JOHN: We also heard this expression, ‘For years, we’ve been swallowed by your culture. One time can you be swallowed by ours?’ We absolutely took that to heart. That became sort of our mantra as we did the movie over the course of the years and we kept people involved from the Pacific islands. We had an oceanic story trust that we bounced story ideas off of costume ideas, the way the characters looked throughout this process. 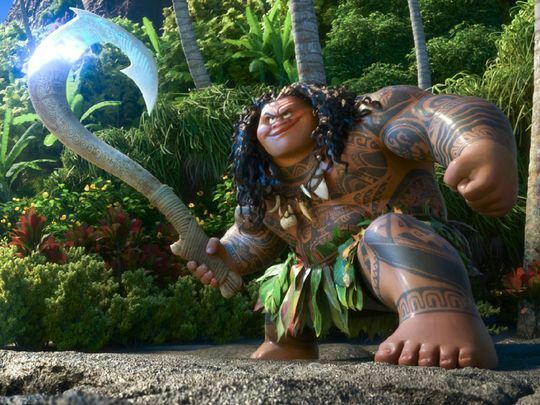 From all that research then, the story line evolved to then revolve around Moana instead of Maui. John said, “And when we went there and we heard about navigation and all this and it was really Ron’s idea, what if we have a character called Moana, which means ocean and we built it around her, someone who wants to be a navigator like her ancestors. I LOVE that! And I really think they got it right! It’s SO good! And you can’t have a conversation with Ron & John about new Disney movies without talking about “Easter Eggs” (where they put characters & little “shout-outs” to former and upcoming Disney movies/characters)! And they shared with us that here are actually quite a few Easter eggs in this one! Look out for Baymax, Olaf, Sven, Squirt, Flounder, Flash (from Zootopia), Wreck it Ralph, and maybe more! In fact, Ron says that Olaf is actually in there a couple of times (I have yet to find him)! As they shared, some are a little easier to find and some are VERY difficult! I love this though – it’s fun to look for them in the movie! So let us know if you spot any! Thanks to Ron & John for making another amazing Disney movie! I’m such a fan of their work, so it was a huge pleasure for me to talk to them again! And, I happened to even run into John Musker with another blogger at the World Premiere just before the movie started! He remembered us from the interview and we shared a quick little exchange! So fun! So, make a splash with the family and go see MOANA!!! !